The Nomad 1 crew arrived at Gosport Marina for sustenance and banter on Thursday evening. Four of us had sailed together before, joined by Debbie a professor in molecular physiology which as with all of our professional lives was to prove useless on the Solent. We had decided that 5 crew was sufficient this year round giving us all plenty to do during the race and not over cramping us at night. As so often happens on the first night we went larger than we should have, thankful that sailing is probably the best hangover cure in the world. Friday was a training day with the idea being to agree a consistent and shared approach to tacking & gybing, along with flying the chute for only the second time ever, reefing & practising man overboard drills under sail should we need it. The wind as we left Gosport west bound was light and really we should have had the chute up then because in the afternoon we needed to reef and our opportunity to practice with it was gone completely. We are racing among 1,600 other yachts tomorrow but our real race is against our sister yacht Dignity, another Jeanneau Sunfast 37′ chartered and crewed by Nomad Sailing chief instructor and graduates. 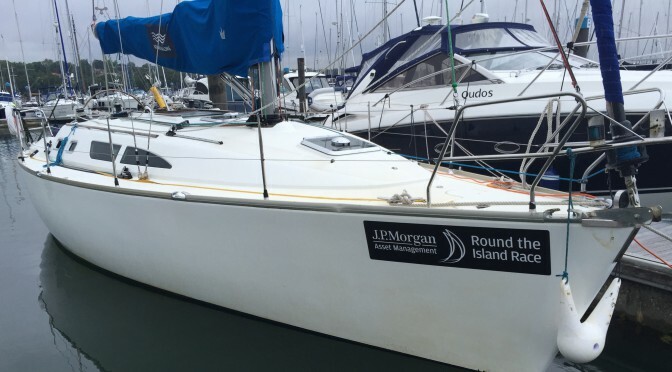 We are all very familiar with our yacht, Nomad 1, having raced her on 3 of the previous 4 Round the Islands. Our yacht had the advantage of the huge chute and a jib essential for beating into strong winds together with a mainsheet controlled from the cockpit. Dignity had a huge genoa (which we expected wouldn’t reef well on the furler in strong winds) but the mainsheet is led to the coachroof making it far more difficult to trim frequently in strong winds. Dignity had an 0810 start, ours was at 0820. We were certain to overtake her.